Dr. Tahira Naseem received her PhD in Computer Science from Massachusetts Institute of Technology in 2014. Her research interests lie in the area of Natural Language Processing (NLP) with special focus on developing language processing techniques for low-resource languages. Prior to her PhD, she received her Master in Computer Science from FAST-NU, Lahore. 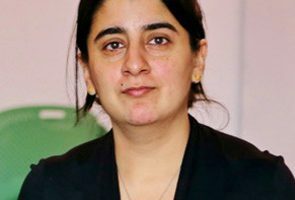 She also worked as lecturer in CS department of FAST-NU, Lahore and as researcher in the Center of Natural Language Processing at FAST-NU, Lahore. Many Views in One: Dependency Parsing Using Corpus Level Models. Tahira Naseem, Tommi Jaakkola, and Regina Barzilay. submitted to ACL 2014. Research Officer, 2004-2006 National University of Computer and Emerging Sciences, Lahore Lecturer, 2006-2007 National University of Computer and Emerging Sciences, Lahore Teaching Assistant, Fall 2010 Massachusetts Institute of Technology, Cambridge, MA Natural Language Processing Served on the review committee for EMNLP 2013, ACL 2013, COLING 2012, ACL 2012, IJCNLP 2011, EMNLP 2011, EMNLP 2010 and ACL 2010. Reviewed for JAIR and IEEE computational intelligence Magazine.